If you want to enjoy a good night’s sleep on your sofa bed, it’s important to invest in a quality sofa mattress. When it comes to selecting the right sofa bed mattress, it’s important to consider the advantages and disadvantages of each type. There are three main types of sofa be mattresses you can consider: spring or coil mattresses; urethane foam mattresses, and latex foam mattresses. A latex couch mattress may be the right choice for your needs if you prefer a mattress that provides the hardest or firmest surface of all of the mattress choices for your sofa bed. Latex mattresses can either be synthetic or natural, made from material obtained from plants and rubber trees. 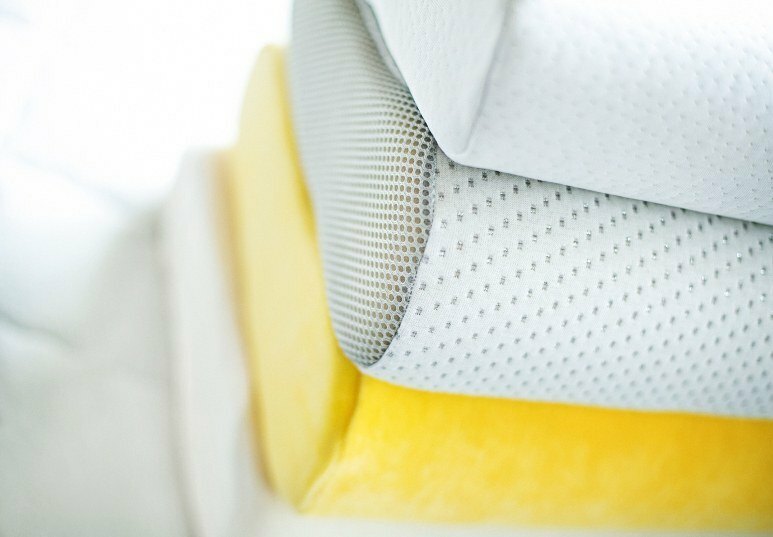 It’s best to choose a natural latex mattress over a synthetic one, as the latter can become discolored if exposed to sunlight in addition to deteriorating much faster. Be aware that a quality latex mattress is priced much higher than most people’s budgets can comfortably afford, especially if the sofa mattress is used only occasionally. A spring mattress is one that features a system of coils for firmness, making it the most economical mattress choice but unfortunately not the most comfortable one. The reason why coil mattresses are not usually the best choice for a sofa bed replacement mattress is because couch mattresses are less than half the thickness of a regular bed mattresses, thus there isn’t a lot of room for springs to float before they fully compress, meaning that poorer quality coil mattresses are the only option for sofa beds (read more about this here). Plus, you might not get as comfortable a night’s sleep on a spring mattress because the coils inside of a spring mattress push back against your body and your body pushes back against the coils unevenly. This can cause pain, poor circulation, and restless sleep. Especially if there will be more than one person typically sleeping on the mattress, spring couch mattresses are very loud. Also, these types of sofa bed mattresses are not as durable as ones made out of foam, and many users become frustrated when the mattress no longer holds the desired degree of firmness. The advantage to purchasing a spring mattress is their relatively cheap cost, and their light weight that makes them easier to transport. If you are planning to sleep on your sofa bed on a nightly basis and don’t have the ability to spend a fortune on it, a high density urethane foam sofa mattress is an excellent choice, as this type of hide a bed mattress provide ample comfort. Depending on the density of the foam, you can find a mattress with an Indentation Force Deflection (IFD), or a measure of firmness, that suits your liking. Foam mattresses offer much more support than spring mattresses, as they distribute body weight evenly, thus relieving pressure points and supporting proper circulation. Because these types of mattresses are made from a solid block of foam, dust mites and mold cannot break the surface, making foam mattresses hypoallergenic. If more than one person will be sleeping on the mattress, foam mattresses are virtually noiseless and movement from one side does not really transfer to the other side. A quality high density foam sofa mattress costs less than latex without compromising quality, providing relief from painful pressure points when lying on the mattress, in addition to offering a firm cushioned surface for sleeping. Trying to purchase a mattress for your sofa bed can be a headache. There are several factors to take into consideration when choosing a sofa mattress and numerous combinations to choose from. According to numerous studies and consumer opinions the best sofa bed mattresses are made out of urethane foam or latex, however the latex ones are very expensive, thus a urethane foam mattress is the best from the quality-price perspective as well.